Most people access their Facebook through Messenger these days. It's easier, quicker and neater. Unless you already have Facebook up on your desktop when you get a message, you're more likely to check it on your phone. Facebook have realised that there might actually be a reason for that and now Facebook messages look a little shinier on the desktop too. 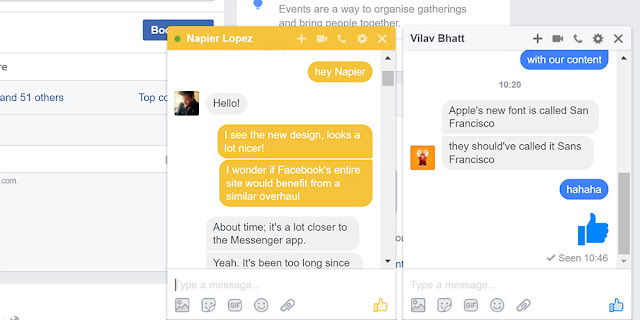 Chat on Facebook for desktop now looks a little more like Messenger. The colours are brighter and if you've changed a conversation colour within Messenger then that chat will also be that colour on Facebook. This means that if you recognise the person or group by a colour, you'll still be able to tell which conversation it is easily on the desktop version. The little icons at the bottom of the conversation have also had a redesign so they look a little neater. These changes are great but they're tiny. The emoji you use in Messenger are different from the ones you use on Facebook as well as all the little posting icons. This might not seem like much, but it can make it a little jarring to switch between Messenger and Facebook. Yes, most people have phones now and will access the Facebook app on their phone, but some people would rather just have Messenger and leave accessing the actual site until they're on the computer. Facebook now looks a little outdated and with how often they update - or at least update the app - it just seems strange that the desktop site hasn't changed much in years. Facebook and Messenger need to start matching more unless they want to become purely app based in the future. As well as the Messenger-like chat redesign, Facebook is also redesigning how the trending topics look. We don't know if they're just testing this or whether this is being very slowly rolled out but how the trending topics are viewed is now changing. Rather than a little summary next to the linked topic, you'll just see how many people are talking about it. This could have been done in the hope that the human editors wouldn't want to risk pushing up trending topics that aren't trending and this could also help make trending topics quicker and more up-to-date compared to when they show up currently. Both updates should change the way we view Facebook for desktop in a small way. I doubt this is the only update we'll see for the desktop anytime soon, but it'll be hard to say what will happen next as it's taken so long to do this much.